The TTR® Tri Thermal Roofing System is a unique combination of two separate roof systems that combine to form the best roofing system available. The system is comprised of a spray applied Polyurethane Foam Roof with a single ply EPDM roofing membrane that is adhered to the Polyurethane foam with a proprietary spray applied slow rise urethane based adhesive. While others have tried and failed at creating similar insulation systems, our patent protected system succeeds! You already know that the Polyurethane foam is the best insulation in the market. It covers your Ontario roof like a blanket in one seamless piece with no joints or gaps, this leads to reduced energy costs with an average of 25% savings. The spray applied Polyurethane Roofing Foam Insulation used in the TTR® System, not only has the highest R-value, it has waterproofing benefits. If your AC or mechanical contractor accidentally punctures your roof membrane, our foam roof will prevent water from infiltrating your building. With other systems, once the EPDM flat roofing membrane is punctured nothing stops the water from entering the building. The insulation boards used under the membrane are not waterproof and typically retain the moisture long after a rain event. This leads to prolong periods of moisture in roof system which expedites rust and substrate deterioration. The insulation boards used in other systems are only butted together which allows air leakage out of the roof, therefore decreasing the effective R-value of the roof. The EPDM membrane used in our system can be either black or white in color. The membrane is available in a variety of thickness to suit your individuals needs. The Eco White membrane is available in 60 or 90 gauge thickness. White is the new green product with high reflectivity keeping the roofs cooler. Eco White membrane meets the Energy Star ratings and the Cool Roof Rating Council programs. The patented TTR® System was developed to provide a superior quality, energy efficient and durable roof to commercial buildings throughout all parts of North America. The TTR® System was invented by Stan Cox, President of TTR®, and has been patented for all of North America. The system has been installed in a variety of different climates, from coast to coast in Canada as well as the southern United States. The TTR® System has been tested by a number of different organizations, including ACRC (Wind Uplift Test) in Fort Lauderdale Florida, PRI Construction Materials Technologies (Physical Properties) in Tampa Florida, Southwest Research Institute (Fire Rating Test) in San Antonio Texas. The system has received a NOA (notice of acceptance) from Miami Dade County Florida enabling the system to be installed in high velocity hurricane zones. TTR® is a roofing system provider with over 30 years of experience in the foam roofing industry. Over the past 30 years, TTR® has installed millions of square feet of foam roof, and has learned how to make the best roofing system even better. TTR ® distributes its patented, energy efficient, durable roofing system to North America. While other roofing providers are adjusting to provide environmental insulation solutions, TTR® has been offering them for years, and continues to provide products that insulate better, save energy, and reduce waste. It’s the perfect solution for an EPDM roof restoration. What is the TTR® system? If you already know the benefits of spray applied Polyurethane roofing foam, you likely also know the major criticism is the absence of reliable and durable UV protection. Coatings are a temporary solution, requiring considerable maintenance, and are not nearly as reliable as the foam underneath. The patented TTR® system takes advantage of the undeniable strengths of a foam roof, and makes it better by adding a protective EPDM flat roofing as a top layer. 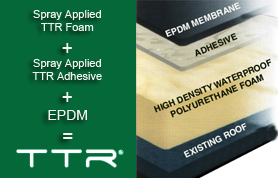 The TTR® system starts with a layer of high-R-value spray applied Polyurethane foam insulation. Then, using a custom-blend spray-applied adhesive, the protective EPDM roofing membrane layer is adhered to the foam. The EPDM layer is tested and certified to withstand extreme weather conditions and UV degradation. The patented TTR® system brings the whole solution together. The high-R-value foam speaks for itself, providing lightweight, energy efficient insulation on top of the existing roof. Next, the EPDM layer provides a level of protection far superior to traditional coatings. In warmer climates, a white EPDM layer reflects heat, and keeps the building cooler. Finally, the adhesive is easy to apply, and provides excellent adhesion to both the EPDM and the foam. It provides superior uplift protection, without the need for fasteners or primers. Even better, the EPDM is applied in a single day, eliminating the need for multiple applications of top coating. Larger width rolls and gauges (thickness) offer various installation options. This single ply EPDM roofing membrane option can be installed inexpensively on big box stores, new construction or recover over an existing roof and can be installed using ballast, mechanical attachment or fully adhered like the TTR® system for best results. Larger width rolls and different gauges offer various installation options. Can be installed inexpensively on big box stores and new construction projects in Ontario. Can be installed with mechanical attachment or fully adhered. The TTR® Tri Thermal Roofing systems unique combination make this roof system the best roof on the market by building on all of the advantages and eliminating the negatives of the two separate roof systems that combine to form the TTR system. The patented TTR ® system brings the whole solution together. The high-R-value spray applied Polyurethane insulation speaks for itself, providing lightweight, energy efficient insulation on top of your existing Ontario roof. Next, the fully adhered EPDM membrane provides a level of protection far superior to traditional coatings. The spray applied adhesive used to adhere the membrane is easy to apply, and provides excellent adhesion to both the EPDM and the polyurethane insulation. It provides superior wind uplift protection, without the need for fasteners or primers. Even better, the black or highly reflective eco white EPDM membrane is applied in a single day, eliminating the need for multiple applications of top coating. Due to the high-compressive strength yet light-weight TTR® system, we are installing solar panels and elevated landscapes on our roofs. Even without tearing off the old roof, we reduce the load on the building by replacing 3 pounds per square foot of gravel with less than one pound of new roof material. The TTR® System is a high quality total roof system if you want to have an EPDM roof restoration at an inexpensive price. Why spend money on other systems when you can get the most energy efficient complete roof system with a full warranty? The installation is simple with minimal interruption. Looking to save costs? On average our clients experience a 25% to 35% savings immediately in reduced energy costs because the our polyurethane foam has the highest R-value, and stops 98% of heat loss, covering your Ontario roof like a blanket in one seamless piece with no joints or gaps. Why spend money on other system’s when you can get the most energy efficient complete roof system with a full warranty. You deserve a break on your energy bill! The TTR® System can translate into considerable savings in the heating & cooling of building – typically 25%. This gives you a return on your investment in only 4-7 years. Buildings with TTR® roofs installed, consume significantly less energy and have a much lower carbon foot print. 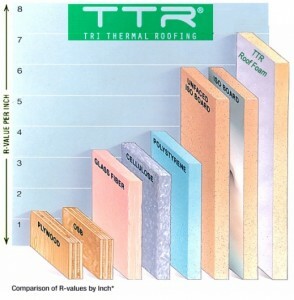 The TTR® System is 60% cooler than conventional built up roofs which can reach 170° Fahrenheit. You the customer has the added satisfaction of sustained protection long after other roof systems have disappeared into landfills and drawn upon non-renewable resources to replace them. The TTR system has a very low life-cycle cost. Along with the great environmental benefits of the TTR® System, Roof top landscapes and Photovoltaic panels can be installed over top of the system while maintaining full warranty. Our system is also available with a black membrane or white energy star rated membrane. Get a new roof today! While Firestone UltraPly Platinum TPO is already backed by an exceptional 30-year Platinum Warranty, it can be further enhanced through the use of Firestone HailGard™ insulation to protect against nature’s harshest elements including 2” hail, 100 mph winds and incidental punctures*. This reduces roof maintenance and replacement expenses by extending roof life. For durability and dependability,UltraPly Platinum TPO delivers. This system can be mechanically attached or fully adhered giving you added versatility. Additionally, the white, reflective surface exceeds ENERGY STAR™ standards for energy savings in warm climates, making it an exceptional value. Roofing quality at Cox Roofing has always been a priority. Unlike other spray foam and coating systems, the patented TTR® System has replaced the U.V. protective coating with a fully adhered single ply EPDM flat roofing membrane over the roofing foam. The EPDM membrane provides an additional water tight seal as well as an extra layer of durability with no fasteners, no expensive primers and no required recoats. The membrane allows the TTR® System to have an extended life cycle and to be installed in the harshest climates of North America. Installation is quick, odorless and will not disturb building occupants. Your roof is first power cleaned and thermal scanned to detect water saturated areas in the roof. Once any problems are corrected the TTR® system is retrofitted over the existing substrate. Our TTR® System has minimal maintenance as any problems are easily identified and repaired with no damage to the building or contents. It is also a preferred option instead of recoats for the millions of square feet of SPF that do require or will require recoating. We can adhere the membrane to the existing foam and coating roof system and provide a new warranty. Cox Roofing offers the best warranty available. We offer our 10 Year Gold Warranty and our 20+ Year Platinum Warranty on both labour and materials. We perform annual inspections on all roofs in Ontario.